Chickens have always been part of rural and farm life. The past decade has brought them back to small-holders, hobby farmers and small, sustainability poultry producers. Although most of us live in cities, we still feel the attraction of the bucolic countryside. Chickens are the easiest livestock to keep. They are remarkably adaptable. Through natural selection and selective breeding, distinctive breeds have emerged. Virtually every human culture has had some kind of domestic chickens. Our human fascination with chickens runs deep and primal. No wonder so many families are bringing chickens home. Domestication of chickens probably began 8,000 years or more ago, when people in Asia noticed that it was easier to weave a cage and put some baby birds in it than try to catch them or search for their nests. The Red Junglefowl of India is the ancestor of our modern chickens. They’re quick on the ground, clever about hiding their nests, and light enough to fly. Catching them or knocking them out of the trees with a slingshot must have taken exacting skills and a sharp eye. Keeping chickens provided these early enthusiasts the opportunity to observe them. Roosters are natural fighters. Cockfighting became entertainment in some societies and took on more serious religious meaning in others. Chickens are naturally social. They form flocks and organise themselves according to a dominance hierarchy, the pecking order. Hens develop alliances and loyalties between individuals, but social life is rarely without incident. An extra worm to a low-ranking hen can set off a squabble, or can improve her standing. Life is never boring in the chicken yard. A particularly unassertive hen who was last at everything in our yard one day discovered a large, juicy Jerusalem cricket for herself. She snatched it up in an unaccustomed gesture of self-assertion and took off, with half a dozen hens in pursuit. They were outraged that she would presume to usurp this tasty delight for herself. Escaping, but unwilling to release her prize, she flapped and ran until she had sufficient leeway behind a bush to gobble her treat in hasty triumph. After seeing her outwit her betters, I felt that perhaps her place at the bottom of the pecking order was not without its comforts. Chances are, you remember visiting a grandparent who kept chickens in the yard. You may have been frightened by a protective hen or an aggressive rooster, or you may recall the surprise of finding eggs. Until the middle of the 20th century, keeping a few chickens was common. Since everyone kept them, everyone knew about them: what they ate, when to expect eggs, what made them sick. The chickens lived in the yard and provided egg money for family support. Traditional lore developed, some of it accurate and some more hopeful than useful. If you didn’t know the answer to a question about your chickens, you could ask your neighbour or your mother or someone at church. Chickens were an integral part of the culture. As people moved to cities and suburban developments, people lost those poultry handling and management skills. That knowledge slipped away, although it’s invaluable to those keeping small flocks. Owners have different expectations for their flocks. Raising birds for meat is different from raising chickens for eggs or to show. They are all chickens, though, and many of the management practices are the same. Small flock owners rarely see their birds as narrowly as simply food or only show. 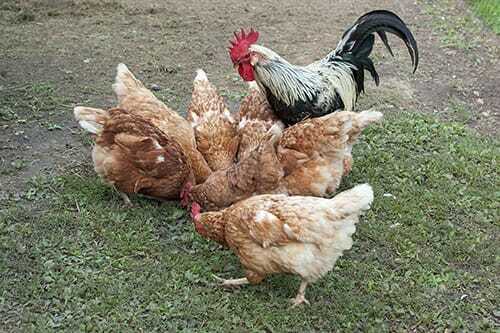 Utility values, egg laying and meat, are integral parts of traditional breeds. After all, that was why they were kept. Small flock keepers naturally appreciate their chickens’ beauty. They learn about breeds and the differences between a Leghorn and an English Game. They may start by raising birds for meat and then want to show the birds they are proud of. Showing is more than an opportunity to be recognised as the best. It is a chance to meet others of like interest and find new birds, new bloodlines, and share ideas. People become farmers because of their desire to grow their own food, be self-sufficient, contribute to the local food economy and feed the spiritual needs that rural life can assuage. Sustainable, integrated systems include poultry as working contributors to farm ecology and production. They consume weed seeds, insects and green waste and produce high-nitrogen manure for fertiliser. Chickens are part of that life. As chickens have become more popular, communities have found ways to make it legal to keep chickens. A certain prejudice against chickens, a whiff of class division, can trigger opposition. 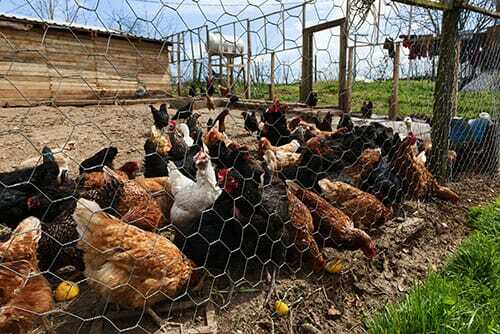 Most communities find some way to allow chickens in urban and suburban settings. Scientific studies compared eggs from hens on pasture to those of battery cage industrial hens. 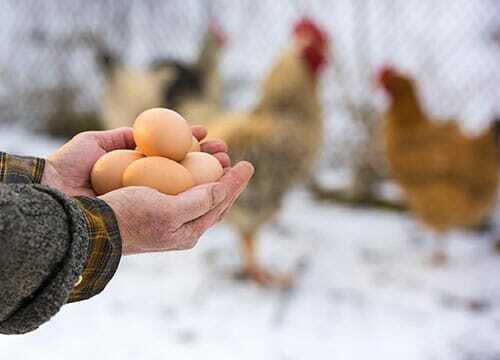 They established that eggs from chickens fed varied diets and allowed to range outdoors are more nutritious, with twice the vitamin E and better omega-3 fats. Nutritional value reflects what the hens are eating, something you can choose if you raise your own. Having truly fresh eggs from chickens of your personal acquaintance is one of the reasons people want to keep their own chickens today. Like so many other home-raised products, the flavour really can’t be compared to store-bought. Gathering eggs can feel like Found Treasure. Every child I’ve ever seen delights in searching egg boxes and gathering eggs. One friend’s daughter was going through a particularly picky-eater stage. She refused to eat nearly everything. I gave her mother some eggs, and they passed her exacting demands. That kid made those fresh eggs her mainstay for some months, while she outgrew whatever it is that makes kids funny about food. A dozen or fewer hens will provide any family and most of your neighbours with plenty of eggs. Sharing them with neighbours generates enormous good will. A sense of humour helps, too. Small groups do better than one or two. Chickens are highly social and need each other’s companionship, although some singletons make do by making friends with the cat. Remember that chickens are subject to predation and even the most careful caretaker loses some chickens. With a few more, you can have fresh meat as well. The accepted wisdom is that if you consider your birds meat, you will not want to name them. You will likely develop some favourites who will have names and be around for along time anyway, perhaps even stay on as retirees after they aren’t laying many eggs any more. If you are serious about breeding, however, you will be culling your flock and filling your freezer and pot with chicken tasty enough to spoil your palate for fast-food fried chicken. Having your own flock of chickens gives you a strong foundation of self-reliance. You have your own steady supply of eggs and meat. They are Everyman’s Livestock, a lot easier to keep than cattle or pigs. Poultry is a more accessible agricultural project than beef or swine for youngsters. Parents without farm backgrounds are less intimidated by chickens. Many disabilities or physical limitations are no barrier to keeping chickens. People like chickens. When I first started keeping a few in my suburban back yard in San Jose, California, heartland of Silicon Valley, the first thing many visitors said was a wistful, “I always wanted to have chickens.” When one chick unexpectedly grew up to crow, neighbours mentioned how charming it was to hear the sounds of the countryside. Chickens attract the eye as well as the palate. Chickens are naturally pleasant to see. Some breeds are especially beautiful and have been bred specifically as ornamental birds. Poultry can decorate your estate, whether palatial or rustic. They are excellent interpretive birds. Historically accurate flocks are kept at farm museums. Chickens can be good therapy birds. Poultry advocate Pat Foreman brings her Buff Orpington Oprah Henfry to nursing homes, where she sits with the residents. They enjoy her peaceful company and soft feathers. Chicken flock owners are widely diverse. Some keep a few and make pets of them. They aren’t cats or dogs, but can be delightfully personable. Their individuality adds the same sparkle to our lives that other animal companions do. Those with more businesslike reasons for keeping chickens nevertheless enjoy their company and take pride in raising healthy, vigorous, beautiful chickens. They contribute to local economies and offer alternatives to industrialised agriculture. The diversity of chickens speaks to the diversity of people. They touch us in profound ways.